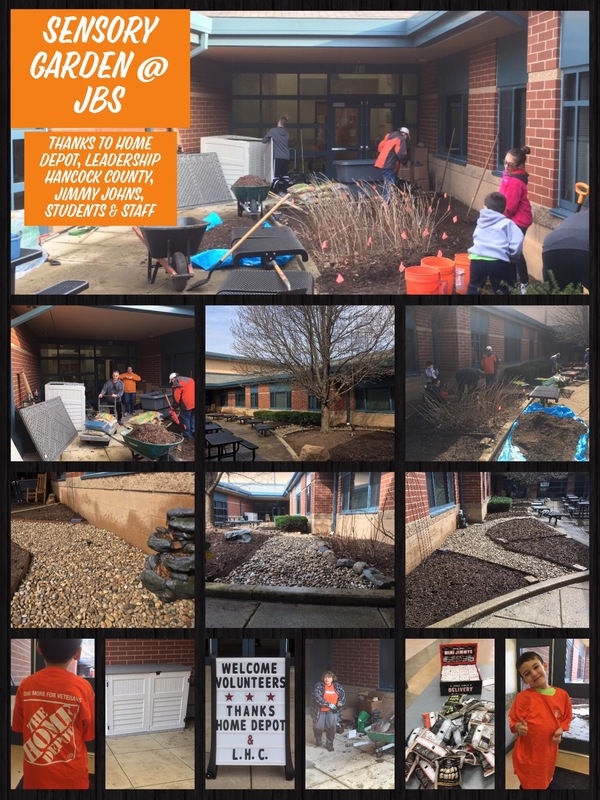 A team of volunteers began work on March 21 to transform the courtyard at J.B. Stephens Elementary school into a sensory garden. Members of the 2016-17 Leadership class brought all their planning to fruition when they began work on a “sensory garden” March 21 at J.B. Stephens Elementary School in Greenfield. The garden, which is being built in the school’s courtyard, is one of six community projects being undertaken by the class. 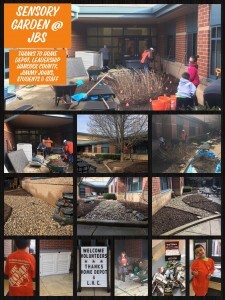 Volunteers from Home Depot and the school — including students — turned out to do some of the landscaping in preparation for adding plants later this spring. The Home Depot Foundation contributed $1,300 toward the project. Jimmy John’s in Greenfield provided food. The sensory garden was the brainchild of class member Matt Davis, who is principal at the school, 1331 N. Blue Road. Davis is also a member of the project team. Other team members are Kate Brown of Hancock Regional Hospital; Teresa Smith of Hoosier Hear Gear in New Palestine; and Kimberly Sombke of Buck Creek Flooring. A schoolwide project will begin this spring to add visual art to the entrances of the courtyard. Everyone at the school will make a sun-catcher, thanks to a contribution from the Greenfield-Central School Foundation. The school also will work with Hancock County Master Gardeners to identify plants to adorn the garden. Team Garden will present a report on its community project at the Leadership Hancock County graduation on May 3. With their classwork behind them, members of the class of 2016-17 are working on their community projects and pointing toward their graduation from Leadership Hancock County. On Wednesday, March 8, the board of directors of Leadership Hancock County set the calendar details for the class graduation. The celebration will start at 5:30 p.m. on May 3 in the conference center at NineStar Connect, 2243 E. Main St., Greenfield. The class finished the classroom portion of its studies on Wednesday, March 1. Leadership II Day featured presentations from a coach from Dale Carnegie in the morning; and an afternoon session led by Hancock Regional Hospital CEO Steve Long on situational leadership. The topics were a fitting conclusion for the 25 class members, who received pointers on public speaking that will help them when they present the results of their community project during the graduation ceremony. They also learned an important aspect of effective leadership: adapting a leadership style to fit the environment and/or to get through to a person you seek to influence. The class was held in the conference center at the Wortman Cancer Center on the campus of Hancock Regional Hospital in Greenfield.